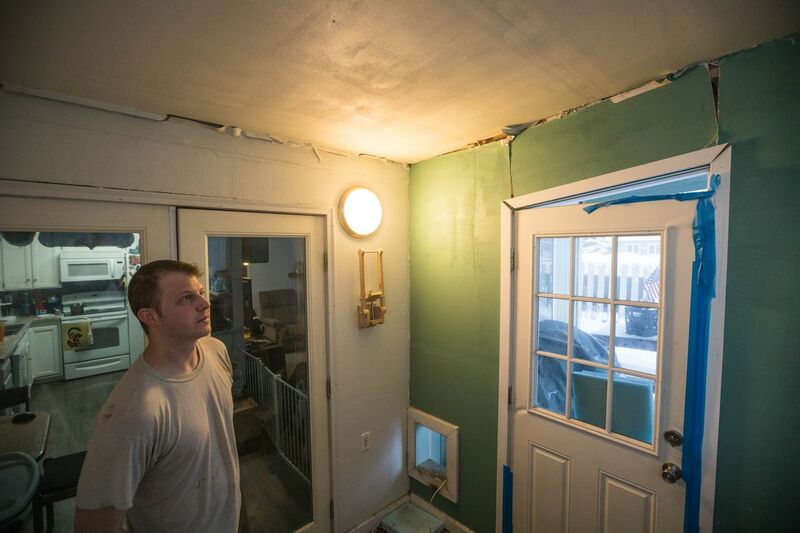 Anchorage residents with earthquake damage need to carefully vet contractors before signing contracts for home repair, city officials said Wednesday. A bulletin posted by the city’s chief of inspections warned of door-to-door solicitations and upfront payments from contractors that may not be properly licensed. City officials aren’t aware of specific instances of unlicensed contractors taking advantage of homeowners, Christopher Schutte, the city’s economic and community development director, said in an email. The warning is proactive, Schutte said, because of the amount of repair activity happening across the city. The 7.0 earthquake that struck Southcentral Alaska on Nov. 30 caused widespread damage, as have its aftershocks. According to the latest tally, a total of 76 buildings were declared unsafe in Anchorage and Eagle River, and nearly 900 more suffered serious damage, according to data provided by Schutte. Nearly 3,000 property owners have requested free inspections from the city. A little more than half have been completed so far, according to Schutte. “As a result of the earthquake, there may be individuals and companies soliciting work to repair damage to your home or property. It is extremely important that a person verifies the legitimacy of a contractor before signing any contracts or paying any monies. Be cautious of people that solicit work door-to-door, ask for payment upfront, only accepts cash payments, or asks you to obtain the required building permits. Make certain the contract clearly spells out the terms, conditions, warranties, and verbal promises concerning your project. You should never sign a contract that you do not fully understand. Municipal code requires that contractors be properly licensed for the work they perform. For example, General Contractors are required to be licensed, insured, and bonded with the State in addition to being licensed with the municipality. Another category of contractor is "General Contractor-Handyman", this license is limited to projects where the aggregate total for the project cannot exceed $10,000 which includes all materials and labor. Per municipal code, a Handyman is not able to obtain a structural permit so they are limited to work that does not require a permit. All structural work shall be performed by a general contractor with proper endorsements. For new work or repairs of plumbing, mechanical, and electrical systems, a separate license is required to perform the work. Typically, a general contractor is not licensed to work on those types of systems. A permit must be obtained for all work in the Anchorage Building Safety Service Area (BSSA). Repair work outside the BSSA does not require a permit. The permit must be posted in a conspicuous place. If the contractor does not post a permit, verify with them that they obtained one and have them post it. Do not allow a contractor to begin work until you confirm they have all of the required permits to perform the work. The owner is responsible for all work performed on the property, as well as the contractor who did the work. Separate permits are required for structural, electrical, plumbing, and mechanical work. If you only have a small amount of work, the general contractor may say a permit is not required because the work is less than $5000.00. This is a misnomer. All work that is considered structural in nature is required to be permitted, regardless of the valuation. The penalty for performing work without a permit is $1000.00 for the first offense. To verify that a contractor is properly licensed for the work being performed or any other related questions, you can call the Municipality of Anchorage Building Department at 343-8211. In order to streamline the permitting process for earthquake repairs, applications can be walked through Plan Review when possible. While each case is unique, most of the residential applications may use this process. Keep in mind, if your property has been red or yellow placarded you must adhere to the recommendations as stated on the placard. If you have any questions about the status or requirements of your placard please contact Don Hickel, Lead Structural at 343-8325, or email donald.hickel@anchorageak.gov. Please include your placarded property address.